It's taken nine months, but The Wolf Among Us has finally wrapped its first season. The question going into this was never, I don't think, "Will it be a good game?" but rather, "Can it live up to Telltale's other series, the award-winning (and absolutely soul-crushing) video game adaptation of The Walking Dead?" Yes. And no. Despite having some similar underpinnings, The Wolf Among Us is a very different game than The Walking Dead, with its own set of virtues, flaws, and grey areas. 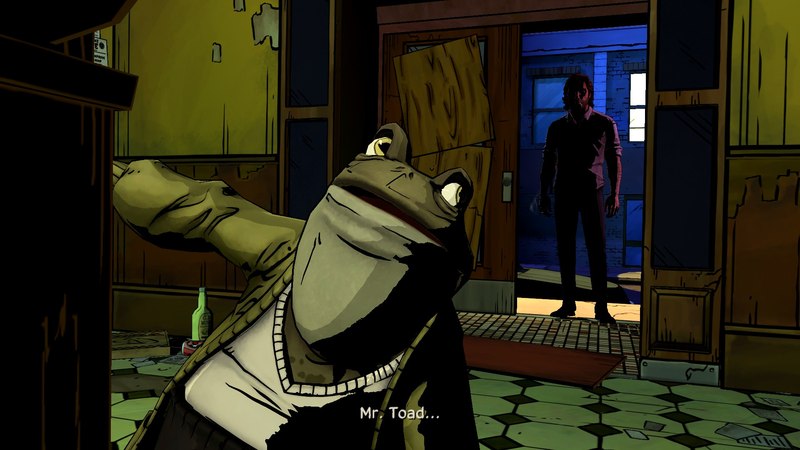 Wolf Among Us (available for Windows, Mac OS X, Xbox 360, PlayStation 3, and iOS) is an adventure game based off Bill Willingham's Fables series of comics. You're placed in the role of Sherriff Big Bad Wolf, colloquially known as Bigby, as he attempts to keep order amongst a broad cast of fairytale characters who've moved to 1980s Manhattan. He fails. A young prostitute, Faith, ends up dead literally on his doorstep, and across a series of five "episodes," it's up to Bigby to unravel a massive conspiracy involving people at all ranks of Fabletown society. It's one part Brothers Grimm, one part Mother Goose, and one part The Maltese Falcon—Wolf Among Us is steeped in neo-noir tradition. You've got your chain-smoking protagonist, your femme fatale, your seedy streets soaked in neon. No, these Fables aren't the fairy tales of old. 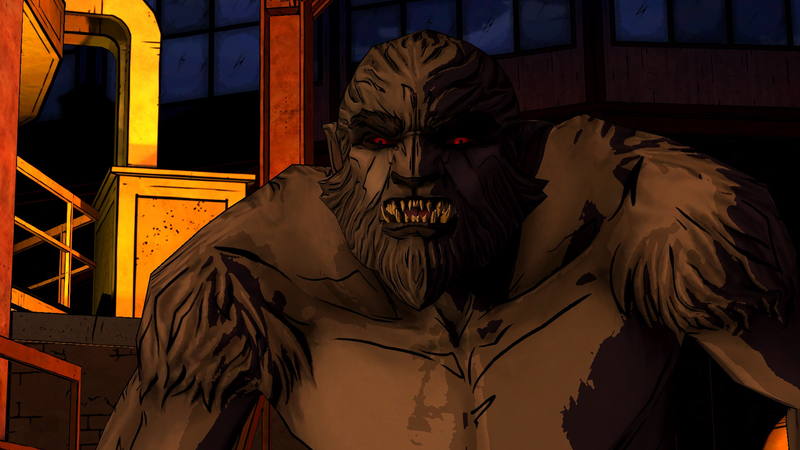 The Wolf Among Us' core mystery is also surprisingly solid. Like Walking Dead, Wolf Among Us is about eighty percent dialogue, ten percent walking around as Bigby, and ten percent action sequences. What starts with Faith's murder quickly escalates into a sordid tale that has you prowling strip clubs and backstreet butcher shops for clues, discussing goings-on with the locals. 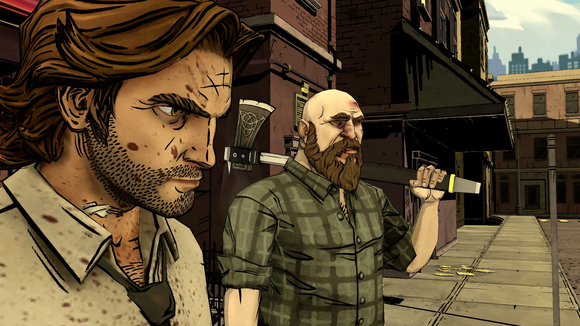 Wolf Among Us isn't as tight as the first season of Walking Dead. It wanders. It meanders. It loses parts of itself along the way, losing focus at time. To its credit, it nevertheless manages to remain compelling throughout the entire series. The first chapter of Wolf Among Us is probably the strongest—it's full of strong characterizations right from the first title sequence and does an incredible job setting up the world even for those who've never read (or even heard of) the comics. The end finds multiple plot strings given short shrift, though, and only a handful of your actions seem to have any consequences. The worst is the relationship between Bigby and Snow White, a key administrator in the bureaucracy holding the displaced Fables together. 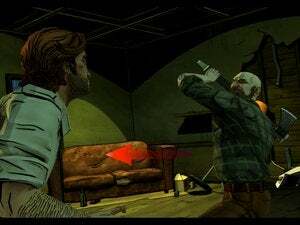 While this relationship is an emotional centerpiece in the early parts of the game—similar to Lee and Clementine in The Walking Dead—it's eventually reduced to a sideshow as Bigby lone wolfs it around Fabletown. Perhaps this is my biggest complaint about Wolf Among Us—it never reaches the emotional peaks it strives for. It tries, at times, but it seems like initial skepticism was correct—the plight of a group of harried zombie survivors is darker than that of some impoverished fairytale characters, murder mystery or no. 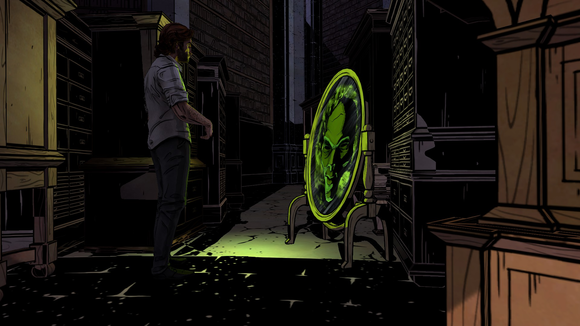 The Magic Mirror's not on the wall in Wolf Among Us. I think part of the problem also resides in the game's enormous cast. Characters seem to drop in and drop out with very little fanfare—Bigby shows up, discusses an aspect of the case with them, leaves, and then we don't see that character for two, maybe three, episodes. At best, a handful of characters make it into every episode but only for one sequence. It prevents you from really investing in any of the characters, especially because their problems seem fairly trivial. While the events in Wolf Among Us concern the whole community of Fabletown, it's hard to shake the feeling that these problems are happening around the characters instead of to them. That's not a problem, per se, but it makes it much harder to feel emotional when one of those characters is involved in something tragic—often I found I didn't have enough of a connection to truly sympathize with their plight (though the Wolf Among Us' strong acting and storytelling still draws you forward even despite the game's hiccups). You became far more emotionally involved with The Walking Dead's smaller cast. Bigby Wolf and the Woodsman, a.k.a. Little Red Riding Hood's hero of legend. The exception is Bigby himself, who's masterfully depicted here. 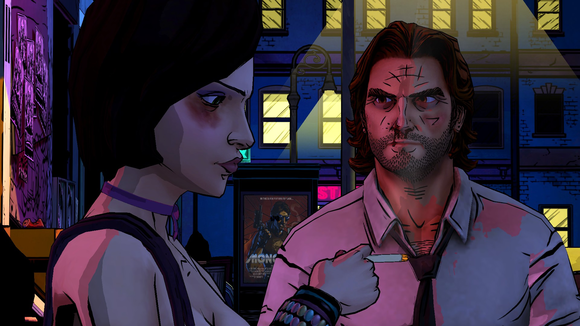 There isn't really a "wrong" way to play Wolf Among Us, because eventually you're going to make your way through the same story. The way you play Bigby, though,well—that can vary quite a bit. Me? I played Bigby as the upstanding wolf he always wanted to be—an officer of the peace trying to shake his big, bad past. (There are some fun story tidbits involving a pig that play into the familiar huff-and-puff tale.) I didn't kill. I tried to keep my anger in check. I tried to refrain from punching people in the face just because they're uncooperative. I tried to be a good sheriff, to be someone the community could look up to. They didn't, of course. No matter what I did, the community focused on my missteps. But that's just how it is when you're part wolf, I guess. You could indulge, though. You could kill, or at the very least maim, much of the cast. You could be The Big Bad Wolf, in other words—man on the outside, but violent murderer on the inside. Best of all, Telltale doesn't attach any morality to your actions. Characters will comment on your deeds and misdeeds, but the game never punishes you for losing your temper. Everything just plays out slightly differently than it might've if you'd kept your cool. And I do mean slightly. Once again, one of Telltale's biggest strengths is the ability to make it feel like you've made a bunch of huge, defining "choices" when in fact 90 percent of the game played out the exact same. I still think Telltale's "action sequences" need work—while some are given proper story weight and thus feel like they have a purpose (such as deciding which of two cars you'll chase after), most are basically just a series of quick-time events—and not very fun ones at that. 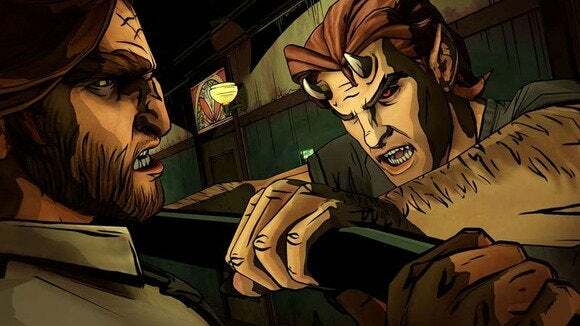 However, Wolf Among Us' action is much improved over Telltale's previous efforts in this department, and I expect this aspect will only get better as they hammer out the last kinks. 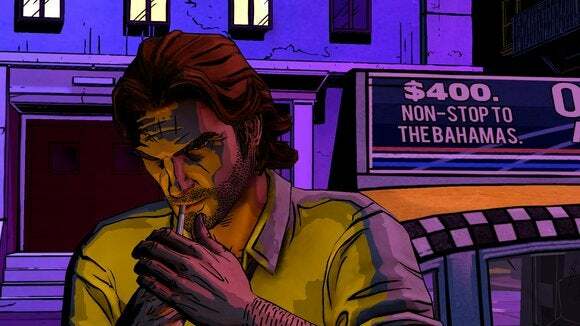 The Wolf Among Us is a pulpy noir story with a spectacular lead character and solid writing all around. It's not Walking Dead, but nor does it try to be—everything from the neon pink and nightshade color scheme to the synth soundtrack hammers home that Wolf Among Us is its own thing. That's especially impressive considering how much DNA it clearly shares with Telltales other projects—the fact that it still feels unique is a feat. The story loses itself a few times, some characters are given short shrift, and there are some questionable reveals, but The Wolf Among Us is still a fantastic experience that does justice to a beloved series. The Wolf Among Us mixes up fairy tales and a noire-ish murder mystery to great effect, even if it loses its way from time to time.